Water Bar - The perfect hospitality promotion to hydrate your conference attendees. Fruit-infused H2O! Infused waters are nutritious, and refreshing. 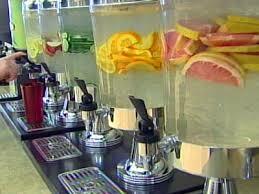 Water Bar is a lounge that will greet your guests with thirst quenching, cold, sweating, colorful water coolers. 3D’s Water Bar provides bold sponsor signage, seating, mouth-watering imagery and scripted staff. Watch as event guest line up for one infused water flavor after another. Projected Performance - 1,500 lounge visits, the average guest spends 20 minutes engaged and an estimated 220,000 ad impressions. Scripted Staff - Brand Ambassadors can be scripted or handout promotional post cards, enhancing the promotion.